Chevannes wins UK Girls' for 3rd year in a row! Starting medical college this fall, 18-year old Sabrina Chevannes is moving on to bigger and better things. However, this was not before she made a lasting statement at the UK Chess Challenge, a tournament involving some 2,000 schools and 70,000 players throughout the United Kingdom. The tournament began in 1996. At 178 grade (2140 ELO), the Birmingham, England native would win her 3rd consecutive crown for best female performance scoring 5/6. Her only loss came to a player of 224 grade (2392 ELO) while she defeated a player of 210 grade (2300 ELO) in the last round. Last year, she made the cover of the British CHESS magazine after winning the same honor. Chevannes appeared to have her breakout year in 2000, winning the under-13 British championship. She would go on to win practically every girl's title, but now will enter a new phase. She hopes to continue her chess endeavors by playing during holiday breaks and summers. All the best! 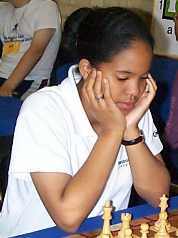 Sabrina Chevannes, then a 13-year old phenom at UK Chess Challenge.